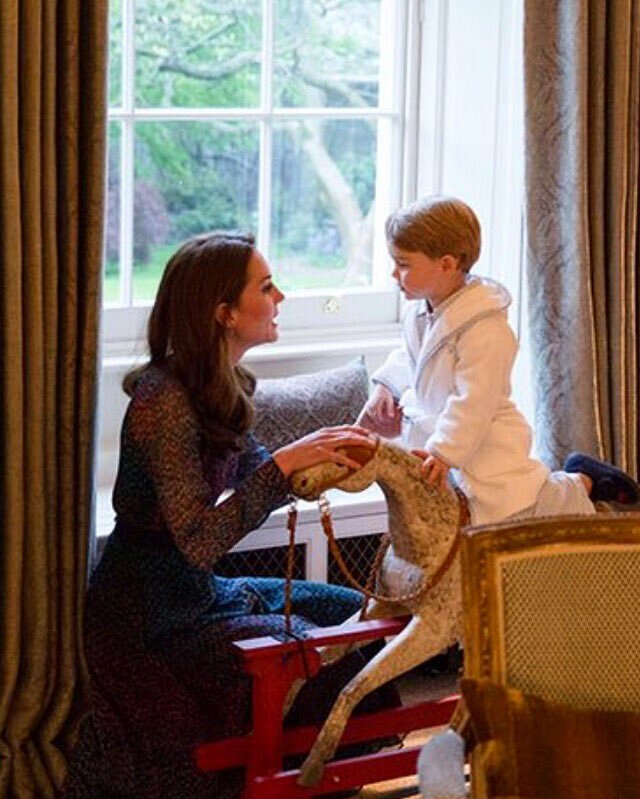 Okay this is just too adorable not to talk about, and since it includes photos of George released by Kensington Palace…we’re gonna slip on our dressing gown, grab a cup of cocoa and tell you all the details. Okay so you’ve probably already read about how The Obamas came to Kensington Palace for Dinner. Now here’s the cuteness that happened after the front door to the palace closed behind them. It did not take long for word to get out that some of the reporters present had spotted George just inside the hallway as the door to the palace opened and then questions started overtaking twitter as to wether George had in fact been allowed to meet the President and First lady. Before long we learned that while Princess Charlotte was sound asleep in her nursery, Prince George had been given an extension on his bed time for the night and had been allowed to stay up for 15 minutes in order to meet President and Mrs. Obama. How adorable those 15 minutes were, though. 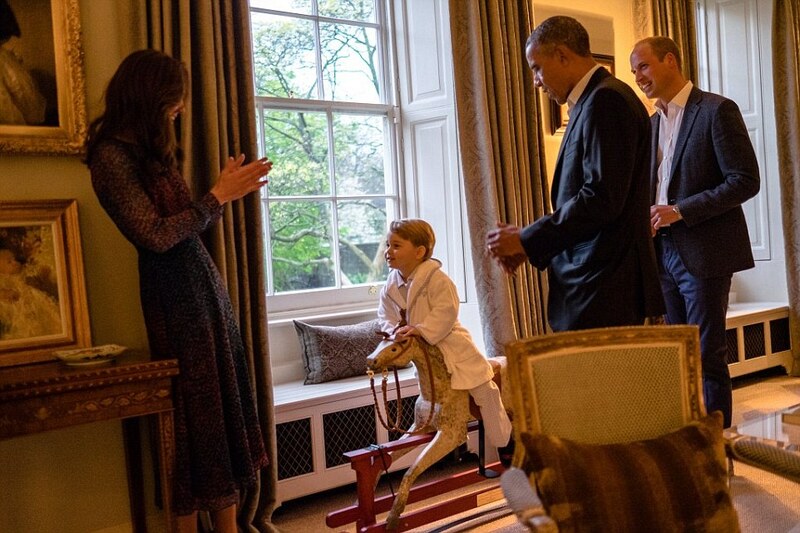 George enjoyed a few more minutes playing on the rocking horse that the Obamas had gifted him when he was born. 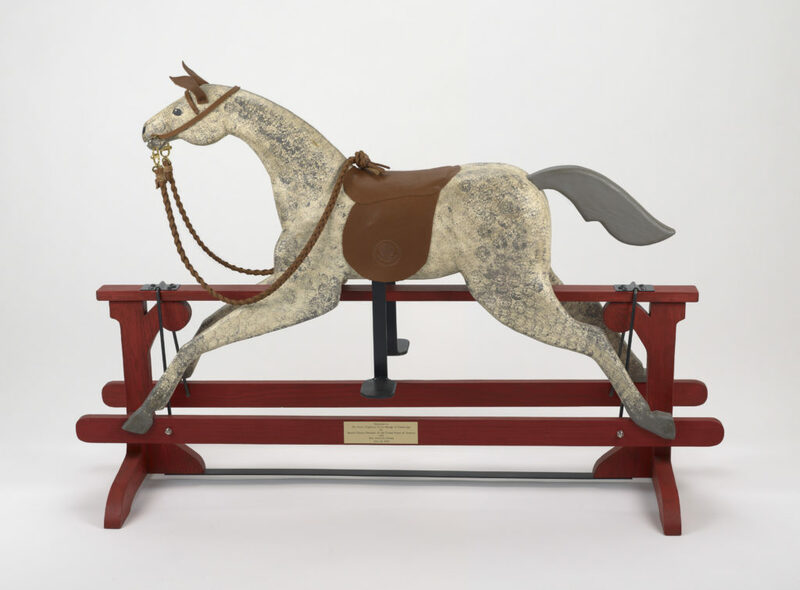 The Rocking Horse was photographed above for its inclusion in the Royal Childhood Summer Exhibit at Buckingham Palace in 2014. 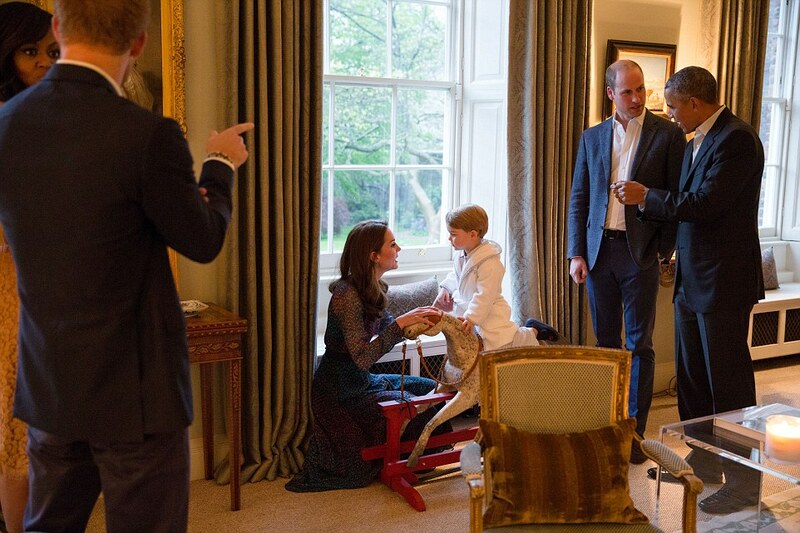 As some of the adults continued to talk, the Duchess of Cambridge knelt to play and have a quiet word with George…she may have been delivering the news that it was indeed time for bed. This part of the photograph taken by White House Photographer Pete Souza is just absolutely precious and is true British Storybook Perfection …I really want to just stare at this for days….can they please use this for the photo on his birthday response cards??? I’ll send two cards just so I can keep one framed on my desk. The final photo we got for the night may have been the one that absolutely stole the show and caused an internet meltdown. 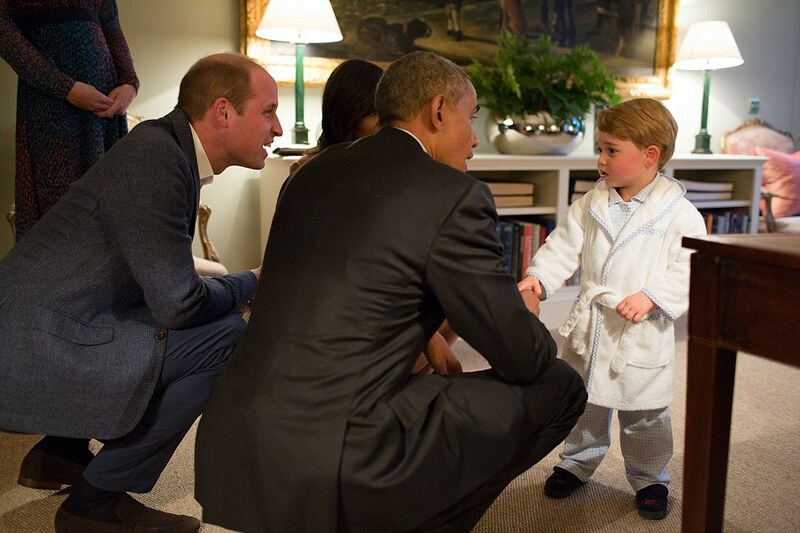 It appears that after sometime playing in the sitting room George retired to hold court in his nursery and formally met President and Mrs. Obama, the nearly 3-year-old prince is seen shaking the hand of the world leader while in his adorable gingham PJs and an adorable dressing gown and slippers. 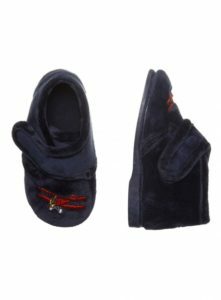 As to what the young prince wore to meet his parents guests for the evening…I managed to sort the robe and others have found George’s slippers…the hunt continues for his pajamas. 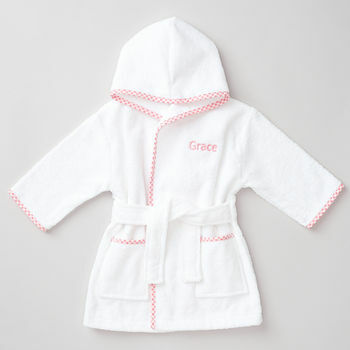 The Robe is by My 1st Years and there is an option for your Prince or your Princess. 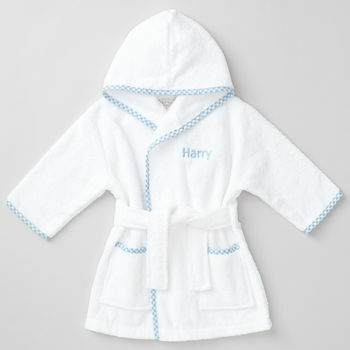 The robes were not available when I was first searching for them but the company is re-releasing them and you can pre-order them now for just £27. You can also click on the images below. 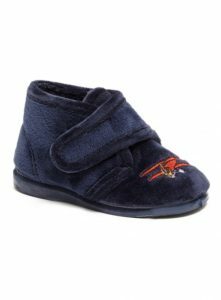 George’s Slippers are the Little Boston Plane Slippers from Trotters.